Fall Webworm larvae are blackhead and redhead races vary widely in appearance and habits. Early instars do not wander from web but enlarge it to include new leaves. Late instars scatter to feed on anything green, becoming very destructive. Late instars of blackheads, yellow-green to pale yellow, covered with fine hairs, later with dark stripe along back, two rows of dark tubercles along back, web and small. Redhead, tawny with orange-red tubercles; web larger and compact. All pass through as many as 11 instars. Damage is more cosmetic than life-threatening to trees. The adults are white, occasional black spots on wings. Orange markings on body and legs; wing span, 1 1/4 in. long; emerge in May or June. Their eggs are in clusters of several hundred on undersides of terminal leaves. The pupae overwinter in dark brown, flimsy cocoons made of silk and hair from the larval bodies; in debris, slightly under soil, or attached to tree trunks. They need 30 degree days at 60° F. and they can infest nearly all deciduous trees. 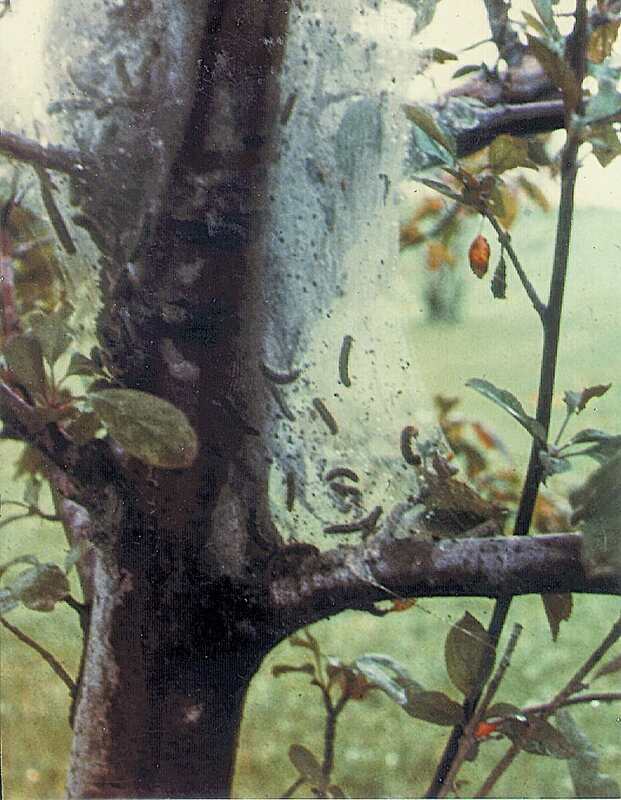 Fall Webworm are worldwide and are Native to United States; Canada; Mexico. Terminal branch webs with larvae in webs jerking back and forth when disturbed. They will cause major defoliation of upper crowns in August. Adults emerge in May-June to lay eggs in clusters on undersides of terminal leaves. Tents are spun and larvae feed from July to mid-September. Timing varies with geographical area. One to four (1-4) generations per year, four (4) being common on Gulf of Mexico States.